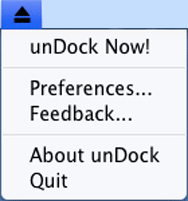 Undock (Mac App Store link) helps laptop users get going faster by automatically unmounting drives all at once. No longer will you have to manually eject every removable drive in order to pack up and go. Undock’s functionality is simple. It will unmount FireWire and USB drives connected to your computer by default. There are options to also disconnect network drives (good for avoiding those disconnection warnings) and CDs/DVDs. Undock is even smart enough to cancel Time Machine backups in order to hasten the disconnection. Undock can operate either as a menu bar item invoked by choosing “unDock Now!” from its menu, or without any presence at all, invoked through a hotkey (which works in menu bar mode as well). Undock can also use the Growl framework for notifications. For example, Undock will tell you when it’s starting to unmount and when it has finished and therefore safe to start pulling cables out of your computer. Power users will be able to get even more out of Undock through its Applescript support. By adding and enabling Applescripts in Undock’s preferences, those scripts will run when undocking is initiated. A dialog could be displayed, a service disabled, a screen saver password enabled, anything Applescript can do. Undock is a happy addition to a road warrior’s toolkit, allowing for a quick, clean exit. Undock is inexpensive for the convenience it provides and the developer has even promised a library of Applescripts on its Website for use with the product to extend its functionality.